Outside the cement walls of the Boise Riverside Hotel, boys lean against hot railings, Styrofoam swords in hand, avoiding the eye contact of anyone who walks by. Inside, the conference lobby’s faded newspaper yellow wallpaper is minimally decorated with Pokémon banners. Kids and adults dressed in red referee uniforms, Pokémon hats and T-shirts, and cosplay costumes are loitering about, catching up with out of state friends, mentally preparing for their next game. Next door is a Minecraft convention. 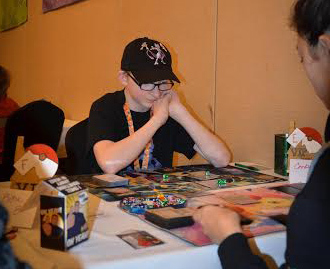 Tournament day for Corbin Todd, 14 years old and an internationally ranked Pokémon player, starts at 8 AM and often ends well after dinner time. Stepping into the tournament room where Todd spends most of his day is like walking into a Pokémon-themed beehive. Tables are aligned perfectly symmetrical along every wall, all chairs back to back. In the crowded room among clusters of kids hunched over cards and play mats, Todd’s short, tow-headed blonde hair sticks out in the same way that his arctic blue eyes magnified by thick glasses stand out on his pale skin. Juniors are the youngest players here, ranging from around 5 years old to 11 years old, seniors are from 11 to 18 years old and masters are the adults. “The masters are bigger cry babies than the juniors so it’s funny to watch an adult get teary eyed over these things,” Bill said. Bill, about average height and much larger than Todd, shares the same pale features as his son but with a short, patchy blonde beard. He is almost never seen without a Pokémon ball cap on, showing off a gap between his front teeth every time he giggles. According to him, if a player gets to top cut, which is the finals of the tournament competing for the grand prize, the day automatically gets much longer. In most cases this prize is expensive Pokémon merchandise or money to travel to bigger tournaments. According to many parents here, Pokémon is really a sport for their kids. They get sweaty, tired and stressed about it. “You have about 10 minutes to go to the bathroom or do whatever you need to do and then they start the next round,” Tami Dillon, a “Pokemom” said. In the corner, a hub of other Pokemoms are sitting on couches and chatting louder than the noise of the Pokémon players in their matches. Dillon is at the center with her thick eye liner that doesn’t quite make it to her tear duct, her bright purple eye shadow and her frizzy dyed red hair just brushing the shoulder of her large flowing clothes. Todd used to get very nervous during tournaments but now walks around with ease and confidence. He tries to get as much rest as possible before his competitions to stay relaxed. “He could potentially be a state champion in a couple hours,” Amanda Todd, Corbin’s step-mother and head judge in Idaho, said. Amanda, who married Bill only a couple years ago, stands under five feet tall, wears wide-framed glasses over her coffee colored eyes and has long, brunette hair. She is the daughter of a local farm girl and a Mexican immigrant. Pokémon is like a game of chess played via cards. A Pokémon, a word mash of “pocket monster,” are the cards the game revolves around. Each Pokémon requires a certain amount of energies to attack an opponent’s Pokémon, which is the object of the game. The challenge is that you can only attach one energy to your Pokémon per turn so you must find sneaky ways to use your cards to attack faster and prevent your opponent from attacking you. Each player creates his own deck to play from the assortment of cards they’ve collected. Nintendo comes out with new Pokémon cards every season that are played exclusively in Japan before anywhere else. The top players look at Japan’s “meta” deck, which is the hot combination at the time and try to recreate that collection here in preparation for when the new cards come to the United States. Todd is not opposed to net decking because he thinks consulting the internet is a valuable resource. When he’s not playing Pokémon, Todd uses his time to either do research or start working on new decks. The Todd family collaborates as a team to improve their game and to help Corbin with his decks. According to Amanda, research is essential and since Bill stays home most of the day, he spends his time gathering intel for the family and for their team. Every deck Todd plays is put together by Bill’s meticulous analysis, Todd’s talent and Amanda’s purchases. Bill, whose other hobbies include fossil collecting and recreating Native American spear heads, can often be seen behind a computer screen in a room full of Pokémon memorabilia surrounded by rattlesnake skeletons and stone arrows. Amanda, who switched to judging in part due to the fact that being just a player or a Pokemom has too many emotional swings throughout the day, remembers this event in a different way. Now Todd walks up to his father to tell him he intentionally drawed with one of his friends to both make it into top cut. Both Todd and his friend, Daniel Sargeant from Utah, will meet each other again in the finals. According to Bill, this is the type of strategizing the old Todd would never have thought of: he used to be incredibly difficult to motivate and take risks. The Todd family used to celebrate his wins by going out to get ice cream after the tournament was over. Now winning is so commonplace to them that they just go home. According to Amanda, Pokémon does not just help introverted kids step out of their comfort zone and force them to connect with others, it also teaches valuable academic skills. Dillon, one of Team Idaho’s regular chaperones, agrees that her own son’s involvement with Pokémon has greatly improved his life in many ways. Both Bill and Amanda understand the importance of Pokémon in their children’s life. Nintendo pays for the Todd family to travel all around North America for Pokémon tournaments so long as Todd continues to win. With her step kid’s quick rise to Pokémon success, the Todd family has had no problem financing their travels. 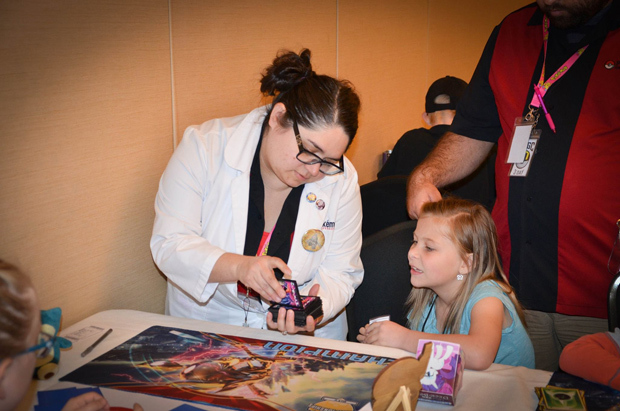 The girl he defeated in his favorite ever Pokémon game, Emily Cheng, 14 as well, is coming up on her eigth year of professional playing with seven Worlds Championships invites. At her best she was once ranked as the 15th top junior player internationally. Cheng is a rarity in the professional Pokémon world; female players make up only a fractional minority of the overall community. Daniel Lynch, 19 years old, who goes by Finnigan online, runs a YouTube channel dedicated to Pokémon but will also be launching a brand new website this month, believes this will help create more exposure for female players. Lynch, with the support of his family, even plans to make a living out of playing and promoting Pokémon. His YouTube videos get anywhere between 50 and 2,000 views and his website will post articles, videos, weekly podcasts and other helpful material all dedicated to improving player’s games. Many professional Pokémon players also make a living off being coaches. On top of making money off of websites, judging, and winning grand prizes, Bill says that Todd, who is a particularly successful player makes a considerable amount of money playing for prizes. In the hallways adjacent to the competition room, a Pokémon marketplace buzzing with people and flowing with cash is where players and vendors sell other games, merchandise and snacks. The Todd family does sell most of their product, but in their new home they plan to dedicate an entire room to Pokémon playing and decorating instead of just the living room. Both the Cheng and Todd families have been very successful working as teams. Much like Cheng, Todd was eager to have his family get into it as well. Amanda said that Pokémon even helped her marriage. The Pokémon community has not only facilitated the kids’ social growth, but both Dillon and Amanda have made lifelong family and friends as well. The Todd family, who travel more often than the Dillons, have created a nationwide web of family for themselves. Both Amanda and Bill started out as players like Corbin but recently began judging instead. When she stopped playing, Amanda was ranked second best player in Idaho and then in the span of a year, she became head judge in the state of Idaho. Bill still enjoys playing more than judging but judging is a more surefire way to earn money. You don’t get paid for being a judge but you get Pokémon product like a box of cards which is worth $100 to other merchandise which you can turn around and sell right at the tournament. Amanda believes she is a successful judge because of her commanding presence, which she gained from her primary job in law enforcement. According to Bill, although many would assume Pokémon is a children’s games, at most tournaments there are more adults than kids. He has even seen old ladies in walkers playing in competitions. The grand prize for winning worlds is a $25,000 scholarship which Todd hopes to win someday. With his newfound niche and social foundation if Todd could change anything about Pokémon it would only be to make the game even more inclusive. Amanda on the other hand, has other ideas of what to change.